Camden traders could do little more than count the cost of the night before as plumes of thick grey smoke trailed across a blue sky. Saturday night had seen a vicious fire rip through markets and buildings along Camden Lock, wrecking livelihoods and destroying businesses. By Sunday morning the usual scenes of traders setting up stalls of hippy clothes, band T-shirts and jewellery were replaced by crowds of lost-looking faces. Camden Market's gates were locked and police cordons were barring anyone from venturing towards Camden Lock where firefighters were still trying to dampen the fire. Talk on Camden High Street - a beacon for anyone after a tattoo, body piercing or pair of Dr Martens - was all about who had lost what. Amer Anand had already received the news he did not want to hear - his trainers and hat stall in Canal Market was wiped out. "It's gone, it's all gone," he said. "It was a really good pitch, it was doing well, I'd just spent £800 on stock on Friday." 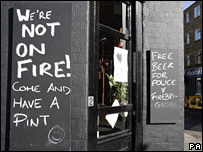 He estimates £5,000 worth of stock went up in smoke and he has no insurance. "Market traders don't have insurance. It's just too expensive," he said. Fellow trader Bed Nath Pahari was hoping he had not been as unlucky. He has £6,000 worth of Nepalese clothes stored in his Camden Lock stall but police were refusing him access to check whether it was still there. Mr Pahari was one among crowds of people who had gathered at the police cordon on Camden High Street. Some were after a glimpse of the drama from the night before, others just wanted information about when they could get back to their shops. 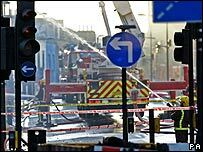 From the cordon several fire engines were visible and a cherry picker - hydraulic crane - manoeuvring firefighters with hoses. For Bernard Perjuci, who runs SK Fashions, it was his home that he was being kept from as well as his workplace. At 2000 GMT on Saturday he and his family were the last in the road to be evacuated from their top-floor flat. "The police rang the buzzer and knocked on the door. We have a two-month-old baby so it was very scary. As I opened the door I could feel the heat from the fire," he said. "Last night we stayed at my brother's but no-one has told me anything about when we can get back to the flat." Most traders from Camden Market were expecting to lose about £2,000 to £3,000 in takings on Sunday - their busiest day of the week. Retailers on the high street opened late, but were determined to get back to normal as swiftly as possible. A town crier was recruited to ring his bell and advise visitors Stables Market was open. And by lunchtime, the familiar Camden buzz was back as crowds packed the high street whether drawn by the drama or Sunday shopping in the sunshine. For some traders though there was a chance to reflect on the long-term impact of the fire. Clare Fairweather, who runs a hippy clothes store in Camden market, thought more upmarket businesses might see it as an opportunity to move into the area and ultimately change its very nature. "Camden's not as it was. There are a lot of boutiques now that have taken away the rough edge which appealed to lots of people."